Mike Haskell, owner of Harbor Diving & Salvage, started his business in the marine industry in 1987 providing underwater diving services. Over those 25+ years, Harbor Diving & Salvage has grown to become a trusted partner in both private and commercial vessel salvage and boat disposal. Harbor Diving & Salvage continues to look for customers that want an honest and trustworthy … long-term relationship. Since 1987, Harbor Diving & Salvage has established and continues to look for long-term client relationships. Beginning with underwater diving services more than 25 years ago, Harbor Diving & Salvage has grown to become a (leader) (trusted partner) in both private and commercial vessel salvage and boat disposal. As Harbor Diving & Salvage continues to grow along the east coast with locations in Maryland and the west coast of Florida. 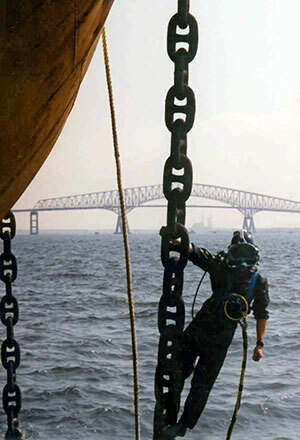 Our technical knowledge, years of experience, and commitment to quality is how Harbor Diving & Salvage provides the most professional services on the Chesapeake Bay. Check out SpinSheet’s article with Mike’s winter storm checklist and tips for making it through the winter with your boat afloat.